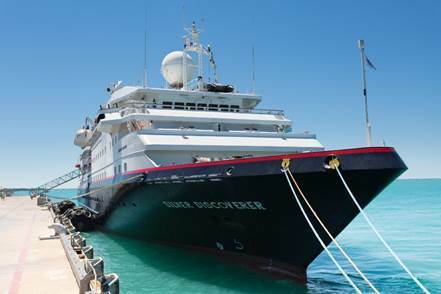 From the spectacular natural wonders of Indonesia, to the tantalising cuisine of Myanmar, sail aboard Silversea Expeditions' 120-guest Silver Discoverer to the hidden archipelagos of the Pacific and Indian Ocean. As part of Silversea's Early Booking Bonus, guests aboard Silver Discoverer voyages departing from November 2016 to December 2017, will receive 10% off the published fare, when booked and paid in full before 30 June 2016. Terms and conditions apply. V9624: (Diving Voyage) Departing from Singapore on 10 November 2016, this 11-day voyage enables guests to explore the volcanic landscapes of Pulau Weh and meet the resident orangutans on Sumatra, before disembarking in Phuket. Fares start from AUS$13,095* per person, based on double occupancy. V9625: Departing from Phuket on 21 November 2016, guests aboard this 11-day voyage can experience historical wonders of India and Myanmar including the 2,500 Shedwagon Pagoda in Yangon. Fares start from AU$11,565* per person, based on double occupancy. V9626: (Diving and Wellness voyage) Sailing from Phuket, Thailand to Maldives (Male) on a 15-day Indian Ocean sojourn, guests can experience the indigenous cultures of the Andaman Islands, discover historic Sri Lankan fortresses and shop for spices in local bazaars. Fares start from AU$16,335* per person, based on double occupancy. V9627: (Diving, Wellness and Birding voyage) Commencing in the Maldives (Male), Silver Discoverer sails to Dar Es Salaam, Tanzania on a 17-day voyage where guests can discover Zanzibar, the "Spice Isle" replete with narrow streets and riveting legends, encounter dolphins and see the rare coco de mer palms in Praslin's UNESCO-listed Vallée de Mai. Fares start from AU$21,015* per person, based on double occupancy. *Terms and conditions apply. Prices include Silversea's Early Booking Bonus offer. Promotion available to bookings made and paid in full before 30 June 2016. Diving conditions apply.